Trying to find the inspiration to write about inspiration, I stared at the screen after I’d signed up and nothing came to mind – what the hell was I thinking! I plucked this theme off the top of my head because I’d been lost for ideas to post about and suffering the odd bout of writer’s block. My kids helped. I told them what I was doing and my eldest began to throw words at me, which I wrote down. So about half of this list is my daughter’s ideas, not mine. I won’t say which ones. Of course today’s letter ‘I’ had to be the theme. In picking this word, I suppose I was hunting around for the creative spark, the thinking outside of the box thing. Except, what is my box? What exactly constrains me from being mentally stimulated? Fatigue is at the top of the list, then lack of time, unwanted distractions… or could it be the unknown? Am I delving into something that makes me uncomfortable or doubting? Perhaps, I’m pushing my abilities as a writer into territory that puts on the pressure. Do I understand what is going through my head and can I shape it into something meaningful, worthy, and creatively fulfilling? It’s a process I should be doing, according to the definition. Being inspired by someone or something is fantastic, often it’s the next step that fails – taking the stimulating burst of imagination and turning into something usable. I worked with somebody years ago who threw out ideas at us all the time for this and that. 99% of them were crap and unworkable, but the 1% was worth wading through the rest – little nuggets of gold amongst the iron filings. So, I’m going to keep hunting around for inspiration and see what happens, because somewhere my 1% is lurking waiting to be found. 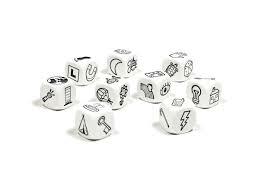 As for today’s book – too many to pick from, so instead, I’ve chosen story cubes. These are six dice with different symbols in each face. You throw one or more and write a story based on the symbols – my kids use them in school. I have no idea what inspires me. I empty my mind, play some soothing music and something happens. An interesting post. So many times, random life moments prompt an essay for me; something happens and I think, “Oh, there’s a story in this.” I immediately jot down notes, then get to work on it. I also find that story prompts, like first lines, help get the inspiration flowing for me, too.